Claudia Patricia Gomez Gonzalez traveled 1,500 miles to the United States, hoping to find a job and a better future. Shortly after she set foot in Texas, a Border Patrol agent shot and killed her. Gomez Gonzalez's shooting Wednesday drew international attention after a bystander posted video of the aftermath on Facebook Live, showing her lying on the ground, bleeding. Authorities changed their account of the incident, adding to the controversy at a time when the White House has cracked down on illegal immigration. Gomez Gonzalez earned a degree in accounting two years ago, but had not been able to find a job. "She looked, looked and nothing," her father, Gilberto Gomez, said. "I believe that's the reason why she decided to pursue the 'American dream'." The agent -- a 15-year veteran -- fired one round from his service-issued firearm, fatally wounding Gomez Gonzalez, the United States Customs and Border Protection said. The agent, who has not been identified, remains on administrative leave. In between sobs, her mother, Lidia Gonzalez Vasquez , said she only wants her daughter's body back. "My girl did not go there to steal, my girl left to move forward and go to school," she said. Her family held a news conference in Guatemala on Friday and asked for justice. "It's not the first time someone dies in that country (United States)," her aunt, Dominga Vicente, told reporters. "There are many people who have been treated like animals and that isn't what we should do as people." Responses to "Guatemalan Indigenous woman shot dead by Border Patrol came to US seeking a job"
Too bad, but what she was doing was illegal and cheating the legals. I have little sympathy for her actions. To Robert Schadt: She came here to get an education so that she'll be able to support her family back home. There's nothing malicious about that. To say that you have little sympathy for this shows that you are the one who deserves no support, not her. I'm sorry for the death of this young woman and I believe the FBI will get this straightened out, and IF a BP Officer was 'wrong' they will be punished. BUT, let's NOT get ahead of the investigation, the FACTS have been confusing as to who she was with and what was taking place. It's NOT uncommon for the Border Patrol to be OUTNUMBERED and be attacked with rocks or what have you by these individuals attempting to cross the border. The incidents and injuries to Officers far out numbers the incidents and injuries that occur to those ILLEGALLY crossing the borders. Some of her family members [like her Aunt] saying these people are killed and treated like "ANIMALS" is not factual at all either. At the present time in USA the MEDIA can't be trusted to present a FAIR and FACTUAL story. Rumors and fear spread the lies and tales of those trekking to USA, officials of various Governments [including USA & MEXICO primarily] and their Agencies use these stories themselves in the FAKE NEWS & MEDIA to fight each other instead of working to solve this problem of the fleeing citizens. 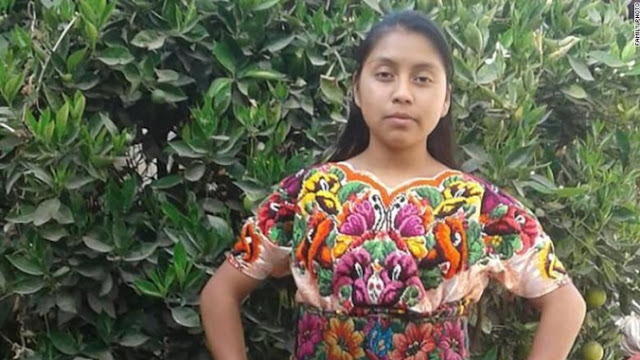 Unfortunately, the reason for the Guatemalan woman coming to USA in hopes of finding a job to better herself and her family mean little or nothing to those responsible in her homeland for improving or solving those matters, but you can be sure the FAKE NEWS & MEDIA of this nation will use her death to malign our present President and his Administration.